This is the first-ever street legal 450 from a Japanese brand. Do you know what that means for the sport? What the future holds for all you brap-hengioneappy hooligans out there riding dirt bikes on the street? Can you tell we’re excited? Hot on the heels of the wildly successful CRF250L and 250L Rally that launched back in 2017, with those pseudo-BMW headlights and their pavement-first attitude, the long-rumored 2019 CRF450L is essentially the all-new CRF450X dirt bike with blinkers and a license plate. Only minor changes set it apart from its off-road brother, and that’s exactly what we’ve been waiting for. Even if you don’t ride dirt bikes, or your view is obscured by thick smoke, or you’re legally blind, the CRF450L looks hotter than deep-fried hell. An ultra-modern LED projector headlight is ensconced in a motocross-style fairing just above an honest-to-goodness dirt bike fender, flanked by svelte LED turn signals. Federally mandated amber reflectors have never looked so good. The CRF450L wears its off-road heart on its sleeve even in road-going guise. Those blinkers are on flexible mounts, so they won’t snap off when you hit a tree. The decals are under the clearcoat, so they won’t peel off in the weekend sun. And the black 7/8” Renthal handlebars sport a red bar pad that displays its name proudly for all to see. That mood carries into the other big street-legal part: a digital dash. It’s a minimalist affair with the usual bevy of indicator lights, and the speedo readout occupies most of the screen space. This no-frills design is another nod to the CRF450L’s off-road intentions – you’ll mostly be looking at the action ahead instead of down at the gauges. Observing the bike from the side reveals slightly less ground clearance (12.4”) and a slightly lower seat height (37.1”) than what’s found on the CRF450X. Circling to the rear of the CRF450L you’ll find an LED tail light and blinkers above that most critical license plate bracket. Brap all you want, Johnny Law can’t stop you now. Unlike the outgoing models, the new CRF450L uses a single exhaust pipe to meet modern emissions standards and deliver more torque. 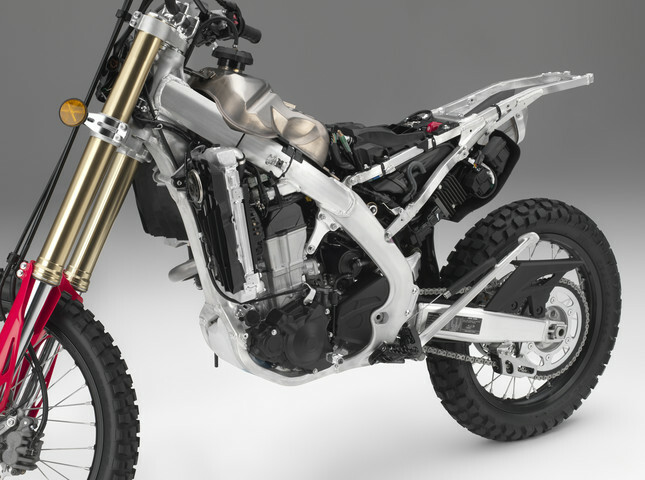 The Showa suspension and aluminum frame are taken directly from the CRF450R, this street legal dirt bike’s motocrossing brother. And that’s not all these rowdy three siblings have in common. Fit and finish are what you’ve come to expect from Honda over the years, both in the fashion department and underneath the CRF450L’s street legal skin. The CRF450L’s beating heart is a 449.7cc four-stroke one-cylinder thumper producing over 40 horsepower and 40 lb.-ft of torque. 40 won’t sound like much if you’re new to dirt from another kind of bike, but on dense wooded trails that power plays out a lot differently. That’s because the CRF450L weighs just 289 pounds wet, so while it’s no Koenigsegg it’ll definitely leave smaller bikes – and most cars – in the dust. 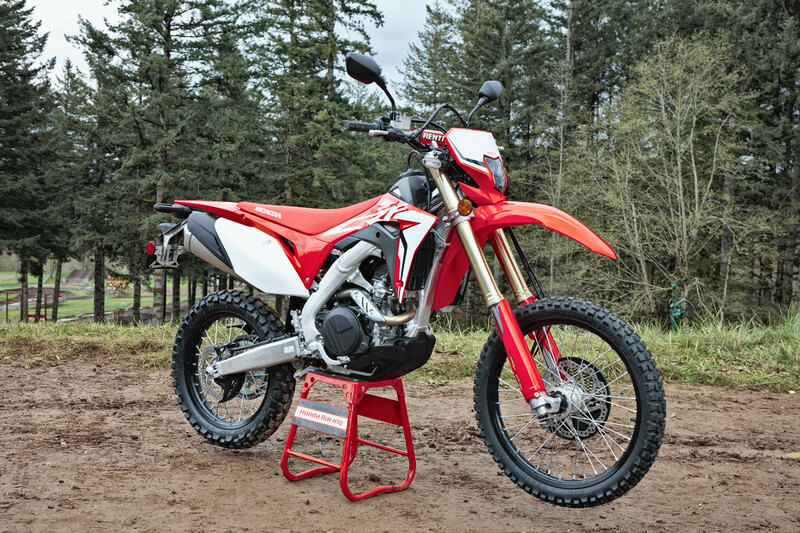 To keep the L streetable the CRF450R engine has received a lower compression ratio and three-ring pistons. Crank inertia is up 12% and the clutch is lighter thanks to reworked internals. A thermostat-controlled radiator fan keeps everything cool at any speed. It’s all to cultivate daily-driver reliability and user-friendliness while staying true to the performance of a dirt bike. The biggest tech news is the inclusion of a 6-speed transmission in both the CRF450L and the X, the first ever in a CRF450. It’s a wide-ratio box that ought to give the CRF450L some proper highway legs while keeping the revs reasonable. It’ll also help you get the most out of the 2-gallon gas tank – the DRZ folks know all about that struggle, but it doesn't stop them from BRAAPing does it? Those fully adjustable 49mm Showa inverted forks are paired with a fully adjustable Showa rear shock; the system is designed to let the CRF450L handle anything from trail riding to urban brapping right out of the box. Calipers from the CRF450R carry over to the CRF450L, grabbing a 260mm disc at the front and a 240 at the rear. Stock rubber is IRC’s GP-21F/22-R setup; we suggest throwing on a set of wire or forged supermoto wheels with street tires if you plan on assaulting the urban jungle. Though the CRF450L’s aluminum frame is largely identical to those of its brethren, the subframe has been strengthened to accommodate your road trip luggage, a Yeti full of Natty, or a few of your closest friends. The Pro-Link swingarm features urethane injection to significantly reduce road noise, or so Honda claims, and the gas cap has a cut-off valve to prevent spillage when you lay ’er over. Not if, when – this is a dirt bike after all. All the fuses and relays are housed in a handy box on the bike’s left side, and even the most intensive maintenance won’t be anything a resourceful person couldn’t handle on their own. That DIY spirit is one of our favorite things about all street legal dirt bikes, and it’s another big reason the CRF450L has us all giddy with excitement. I won’t sugarcoat it: the CRF450L is the biggest thing to happen to street legal dirt bikes since KTM saved the two-stroke. The fact that we now have the first ever factory street legal Japanese 450 can only bode well for the future of street legal dirt bikes. Once other companies see how well the CRF450L does on the market, who knows what the future may hold. Anything that turns more people on to the sheer joy of being on two wheels is something we’ll proudly stand behind. We can’t wait to see the CRF450L on the streets, right next to street legal WR450s and KTM two-strokes we’ve helped put license plates on. And if you have a dirt bike you want to ride on the street, Dirt Legal can get you plated for as little as $299. Call or click to get started today. Older PostIs Dirt Legal Legit?